The cricketers at Sunstar have started the season in scintillating fashion, with some strong performances over the first few rounds of the Australian Domestic Summer. 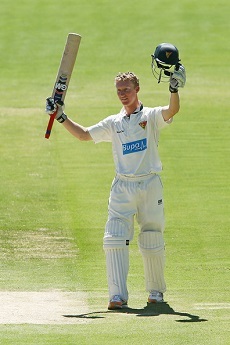 21 year-old opening batsmen for Tasmania Jordan Silk has compiled an impressive 369 runs with an average of 46.13 after the first four rounds of the Sheffield Shield. This puts him 5th on the list for most runs scored so far this season. He now has scored 4 centuries and 3 half centuries in only 9 First Class matches and is without doubt one of the most promising young batsmen coming through Australian Cricket. Left-arm orthodox spinner Steve O’Keefe has also started his season brilliantly by claiming 15 wickets at an average of 21.6 for NSW. This places Steve third in overall wickets taken so far this season with the best economy rate and average amongst all bowlers over the first 4 rounds of the Sheffield Shield. In the recently completed match at the SCG against QLD, Steve claimed his 100th First Class wicket. He now has 100 wickets at an average of 25.76 and is statistically the best spin bowler in the country – he also has over 1000 First Class runs at an average of 28.61. Dual-International Ellyse Perry has been in solid form for the NSW Lend Lease Breakers – they are currently leading the WNCL and WT20 Leagues due to their undefeated start to the season in all formats. Ellyse received player of the match in the WT20 match against ACT on Sunday after her 56 not out off 48 balls, she was was also in fine form on Friday in the One-Day Fixture smashing 40 not out off 30 balls. The Commonwealth Bank Women’s Ashes Series begins on January 10 at the WACA. Mitchell Starc is recovering well from the stress-fracture in his back and is aiming for a return to Cricket at the back end of the KFC BBL|03 campaign with the Sydney Sixers.